Welcome to TriFood.com! We’re committed in providing information about Korea and its delicious, healthy food. Our mission is to spread the awareness of Korean cuisine to those who are interested in exploring new and bold flavors. We're consistently updating our site so feel free to visit us frequently to learn about Korea and its popular dishes. Additionally, we're constantly adding new restaurants venues on our site so feel free to browse through our directory to find local restaurant information throughout the Tri-State area. 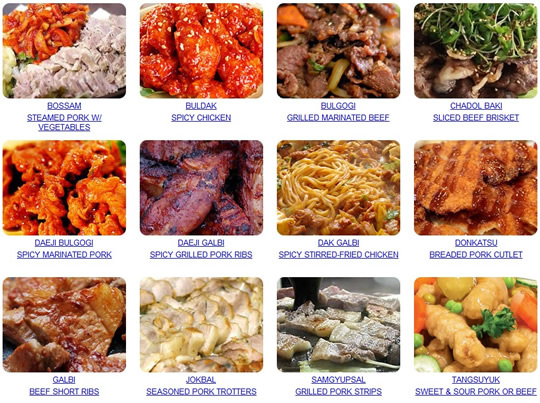 If you own a Korean restaurant or simply want us to recognize your favorite restaurant around the New York, New Jersey or Connecticut area, feel free to bring it to our attention. We'll gladly add them to our site, free of charge. To see visual illustrations of popular Korean foods, please click on the image below or on the Main Dish link found in our navigation menu. If you would like additional information or want us to add a particular dish to our current portfolio of foods, submit your request to info@trifood.com.